Rob Lamb and Brian Nelles and most of our Orlando team (plus a couple out-of-towners) taking a well-deserved break. Let’s kick off this crazy weekend down in Florida, where a pretty sizable contingent from PSSI Global Services has been working around the clock for a couple of our biggest customers. Owners Rob Lamb and Brian Nelles were in town to take our hard-working Orlando staff to a well-deserved dinner after taking a look at several big works-in-progress in our Satcom division. This work includes, but is not limited to, the ongoing upgrades of our expanding Ku-band fleet, gear assembly and prep for next weekend’s Super Bowl in Atlanta, and putting the finishing touches on the C27 mobile teleport for the beginning of another big season of NASCAR action. 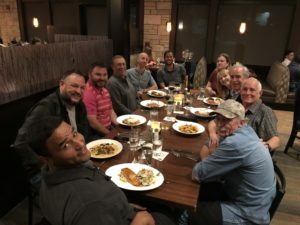 In addition to our core Orlando crew, Kyle Meyer, Ben Bradshaw, and Jonathan Ayala were in town for the C27 prep work, while Kevin Spangler and Tracy Michaels were on hand for some big Golf Channel events and meetings. All of this activity is culminating as we speak at Daytona International Speedway, where Kyle, Ben, and Jonathan are alongside Rick Ball and Justin Roszak to kick off the NASCAR season in a big way. It’s the Rolex 24, the inaugural race in the IMSA WeatherTech SportsCar Championship series. Our team is outputting an unprecedented 32 paths of video via both AT&T fiber and satellite as they gear up for the 24-hour racing action this weekend. This is well beyond the scope of what we accomplished last year, a feat of engineering that ultimately won us an Emmy. It’s an auspicious beginning to what will surely be an even bigger and better year than 2018, and there is no other company in the world who can do what our engineers are doing right now in Daytona. Congratulations, guys! Back down the road in Orlando, our Golf Channel crew is finishing up yet another week of flawless transmission services. Atlanta-based Kevin Spangler is calling Orlando a second home as he’s finishing up a second week of Golf Channel work at the Orange County Convention Center for Golf Channel’s extensive coverage of the PGA Merchandise Show. Just around the corner, Jonathan Ayala (taking a break from NASCAR prep) and tech manager Tracy Michaels were on hand for PGA Demo Days, the largest outdoor demo in the world of the latest and greatest golf equipment and accessories. All the way back in California, Wes Hill is back at Torrey Pines Golf Course in La Jolla, CA all week long for the Farmer’s Insurance Open. The weather’s been beautiful after Southern California’s torrential rains, so he should wrap up on schedule by Sunday afternoon. The weather’s not so great in the rest of the country, but our guys are keeping themselves and their trucks warm. Plenty of basketball on our schedule, as usual. Mike Howley and the C45 truck were at the Capitol One Arena in Washington, DC on Thursday for NBA hoops, when the Golden State Warriors took on the Washington Wizards. Howley’s taking a couple of down days along I-95 as he gets ready for some Big East action on Sunday, when St. John’s hosts the Georgetown Hoyas at Madison Square Garden on Fox. That’s going to be a great game! Dennis Smith and the NT21 were back at Temple University in North Philadelphia, PA on Thursday when Memphis Tigers were in town to take on the Temple Owls. Dennis is back again on Sunday at the Liacouras Center when the Cincinnati Bearcats come to town. Dave Buckman and the Columbia truck will be at Reitz Arena at Loyola in Baltimore, MD on Saturday when the Colgate Raiders battle the Loyola Greyhounds. NT22 with Mike Lemieux will be at Gampel Pavilion at University of Connecticut in Storrs on Saturday when the Wichita Shockers face the UConn Huskies. The C42 truck with Blake Blomstrom will be at the Wells Fargo Center in Philadelphia on Sunday when the Seton Hall Pirates travel to face the Villanova Wildcats in another big game on the Fox Sports networks. And in more CBS Sports Network action, Rick Kolinek and the K22 truck will be at Redbird Arena in Normal, IL on Sunday when the Indiana State Sycamores face the Illinois State Redbirds. It’s also quite a busy weekend in the ring, and that’s the way we like it! Mati Kerpen and the NT34 Sprinter will be at Barclays Center in Brooklyn, NY on Saturday for more Premier Boxing Champions fighting, when undefeated WBA Welterweight World Champion, Keith Thurman, returns to the ring to defend his title again veteran Josesito Lopez. The co-main event is rising star and undefeated heavyweight contender, Adam Kownacki, battling Gerald Washington. Mati’s handling the international distribution of the fight night from Brooklyn. John May’s trading his normal rig, the CK48 mobile teleport, for something a little smaller as the parking is tight at the Toyota Center in Houston, TX. John’s in C21 providing multiple transmission pathways for our friends at Aldea with distribution to DAZN. LA-based Mark Huss has also made the trip to Houston to provide ringside commentary services to international announcers. WBO Junior Middleweight World Champion, Jaime Munguia, defends his title against Japanese contender, Takeshi Inoue. The co-main event features Jesus Rojas versus Xu Can. Plenty of undercard action, as well, that we will help distribute to DAZN subscribers around the world. The CK30 mobile teleport has arrived in Phoenix – the calm before the storm. 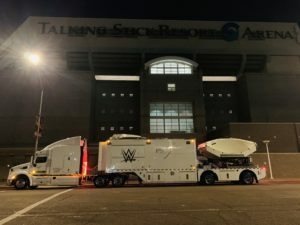 Joe Kelderhouse has hustled the CK30 mobile teleport across the country to Phoenix, AZ, where WWE will be taking over the town for the next few days. Project manager Logan Schinto joins engineers Zane Michaels and Nick Ray for the weekend’s action, which kicks off at the Talking Stick Resort with the NXT Live event on Saturday. No less than five titles will be on the line, including the North American Championship Match between Ricochet and Johnny Gargano, the Tag-Team Championship between Undisputed Era and War Raiders, the Women’s Championship between Shayna Baszler and Bianca BelAir, and the NXT Championship Match between Tommaso Ciampa and Aleister Black. The fun and excitement continues on Sunday when our crew heads over to Chase Field in Phoenix for the official start of the Road to Wrestlemania with the WWE Royal Rumble pay-per-view. This year’s events will include the Raw women’s championship, the Smackdown women’s Championship, the Smackdown Tag Team Championship, the US Championship, the Cruiserweight Championship, the Universal Championship, and, of course, the Royal Rumble. The PSSI International Teleport (PIT) will be at the heart of the weekend’s transmission schemes, providing extensive quality control, recording, and turnaround services for our friends at WWE. As if that weren’t enough, CK30 and company stay in town for Monday night RAW and Tuesday night Smackdown before driver Devon Porter tags out Joe for the next stop on the WWE tour. The action never stops! Senior engineer Paul Blomstrom is also in the Phoenix area for a very special project in collaboration with Sneaky Big Studios in Scottsdale. Our K34 production/uplink unit will be stationed at Sneaky Big Studios for the duration of the inaugural season of the Alliance of American Football (AAF). Every weekend we will provide remote production services for the pre-game and halftime shows of this exciting new league. We will also be providing some remote data and video services at the stadiums in collaboration with our friends at AT&T Global Video Services. Stay tuned for more! 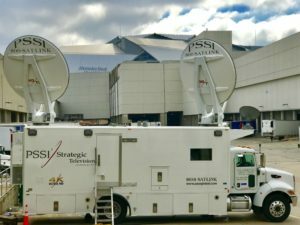 The CK25 mobile teleport in Atlanta for Super Bowl LIII. You ain’t seen nothin’ yet! Speaking of football, you might’ve heard there’s a big game going on in Atlanta next week. We’re already rocking and rolling outside Mercedes-Benz Stadium for CBS and CBS Sports Net, and next week we’ll have a veritable armada of trucks and engineers converging on Atlanta in anticipation of Super Bowl LIII. Craig Henry and the CK25 mobile teleport will be maxed out with inbound and outbound feeds across all the CBS networks. If there’s something Super Bowl-related on your TV in the next week, chances are it’s coming through Craig’s truck. More on our Super Bowl activities in next week’s roundup! Awards season is really in full swing. Earlier in the week, Chris Hovden and project manager David Gallardo were right there at the Academy of Motion Pictures in Beverly Hills for the much-anticipated announcement of the 2019 Oscar Nominations. We’ll be there in full force for the show on February 24th. This weekend we have the Screen Actor’s Guild Awards, a great event we do every year. Awards show extraordinaire Brian Blomstrom is in town to run the CK35 mobile teleport for Turner’s domestic broadcast, while Chris Hovden and David Gallardo will be in the truck for the international distribution of the show on Sunday. This year’s SAG Awards will be hosted by Megan Mullally, and will include individual and ensemble awards for the best in film and television. Also in LA this weekend, it’s another live musical on Fox! John Jennings will be at the helm of the C43 truck to uplink the live production of the Tony, Grammy, and Pulitzer Prize-winning musical, Rent, which will air on Sunday night. John’s got a full day of testing while the all star cast – including Jordan Fisher, Tinashe, Valentina, Brennin Hunt, Mario, Vanessa Hudgens, and Kiersey Clemons – rehearses until they get it just right. 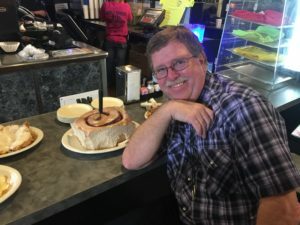 How many calories in that thing? We hope everyone enjoys the entertainment we’re bringing to your screens this weekend! Check back next week for still more live television from around the world.